52 weeks. 52 different writers. 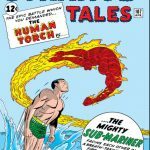 2 trade paperbacks or hardcovers a week. 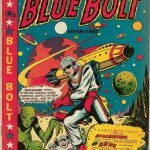 Each week I’ll take a look at a different writer and read two different collected editions from within that person’s repertoire to help in the examination of their work. 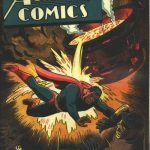 The one and only Frank Miller is this week’s featured writer, as we glimpse at his unique style of crime stories for superhero books. 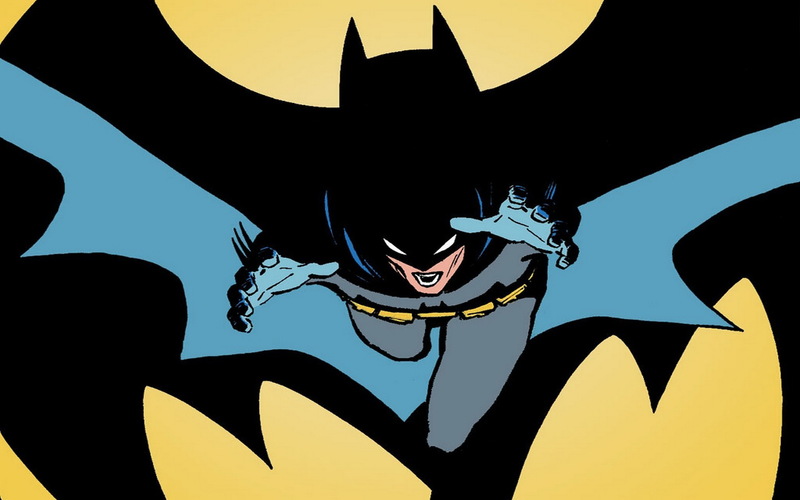 Frank Miller is perhaps most well known for the work he did with Batman in the series “The Dark Knight Returns”, chronicling the return of Bruce Wayne to the mantle of Batman decades after retiring from the role. It’s a dark, gritty dystopian take on the character but that’s not the story we’re here to talk about today. Instead we’re looking at Batman: Year One, the other Batman storyline that Miller is well known for. It serves to almost bookend Miller’s time with the character as Year One takes a look at the start of Batman’s career instead of the end. 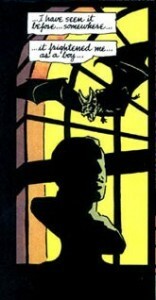 Year One also marked the second major collaboration between Miller and David Mazzucchelli, garnering critical acclaim for the realism presented between the two creators’ contributions. 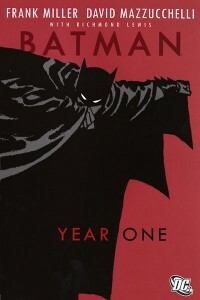 Batman: Year One follows the lives of Bruce Wayne and James Gordon during their first years as Batman and Lieutenant of the Gotham City Police Department respectively. Bruce Wayne returns to Gotham after spending thirteen years abroad to train himself so that he could try to fix the dark city. Jim receives a transfer to Gotham City and brings along his pregnant wife, Barbara, as he tries to settle into his new position on the police force. The year quickly passes by for both men as they deal with love, revenge, corruption, and justice, combating against each other before finding common, uniting ground. There aren’t many great Jim Gordon centric stories in the Batman world and that may largely be why Batman: Year One works so well overall. It is the dual perspective that Miller gives the reader that really locks you in. Yes you’ve heard Batman’s origin told time and time again but here Miller solidifies his vision of the character and adds in the wrinkle of an up-and-coming Jim Gordon to give you a story that feels brand new. The two different narrative threads compliment each other beautiful, often switching back and forth between each other without ever feeling as though the story is stalling out. Miller neatly fills out gaps in time by jumping between the two characters, using a slow moment in one character’s year as a reason to transition over to the other character who is in a more immediate sense of action. There are even a few points where both men are occupied on the same evening and their paths intersect in ways that grip you and don’t let you go. With all this said, there are instances where the dual perspective only slightly hinders the story. There are a few scenes that interject and feel pointless because of their brevity, cutting interesting scenes short or they become interesting and cut off far too soon instead of expanding outwards. Even still, this is only a minor grievance in an action-packed story that has more than enough time to breath. Miller injects plenty of obvious and subtle symbolism during this year-long tale. The stories being told for both characters come across as incredibly personal ones. Everyone already knows that Bruce Wayne is motivated by the death of his parents but that still doesn’t make the emotional impact of the way things are presented feel dull. With the way Miller scripts scenes with Bruce, you can feel the weight of their deaths constantly hanging around his neck like a dirty, fraying noose. There is never your average mentioning of Bruce’s dead parents, each time it is mentioned and expanded upon feels deliberate by Miller, ensuring that each moment spent trying to understand Bruce is endearing as well as dark. It’s watching the failures and shortcomings that keep Bruce motivated that push this story forward, watching a rookie take the early steps towards becoming a master. Meanwhile, on Jim Gordon’s side of things, we watch a story centered around fighting corruption and staying true to one’s self. Throughout the entire tale Jim is faced with external and internal influences that try to push him to travel astray from the path of being a righteous man, nearly succumbing to these temptations only to fight back in the end. With a pregnant wife, the onus always falls on Jim’s shoulders to make sure he comes home at the end of every night so that he can provide for his future child. I’ve gone to great lengths to point out how important the dual storylines are to Year One but they would all fall apart without the stellar characterization done by Miller here. Miller focuses less on the posh, party boy exploits on Bruce, taking time to acknowledge that side of him but never really delving into it, and instead focuses on the tormented nature of his soul over his parent’s death. Every swath that Miller cuts into Bruce’s past is a deep scar that will never heal and you feel the pain he experiences on the daily because of the words Miller chooses. You fully understand Bruce’s journey into becoming Batman and how there’s more than just the death of his parents driving him. It’s his desire to strike fear into those who make other people fearful, his desire to become a symbol of hope that still scares evil doers, that drives him forward. If you try and say that there is a single scene in Jim Gordon’s history that is more powerful than his showdown with Flass, you’re dead wrong. No debating it whatsoever. In all honesty, as interesting as Miller makes Bruce, it’s the journey into Jim Gordon’s life and mind that is the most fascinating part of this story. You watch as he constantly battles back against corruption from all angles, fighting at every turn to ensure he comes out the better man. He can’t turn a blind eye to the dirty cops of the GCPD, even if they are his fellow officers and it results in the single greatest Jim Gordon scene ever as he takes the fight to Lieutenant Flass to show that he is tough and won’t be bullied over his disagreement about the lay of the land in Gotham City. All the while, with this corruption clawing at his back, Gordon also has to bat back temptations of lust as he must choose between a woman without emotional baggage and the woman who is carriage his son. To watch how the every day corruption Jim sees actually effects his soul and puts him in a position to facilitate adultery is one of the high points of this story as you being to sympathize for him through the character work of Miller. You see a man torn asunder in all directions with little hope coming out unscathed, but it’s how you watch Jim fight back that will have you coming back to read this story time and time again. Frank Miller loves action, which is something he loves to shine through in all his work. Best Line Of Dialogue/Caption: “Ladies. Gentlemen. You have eaten well. You’ve eaten Gotham’s wealth. Its spirit. Your feast is nearly over. 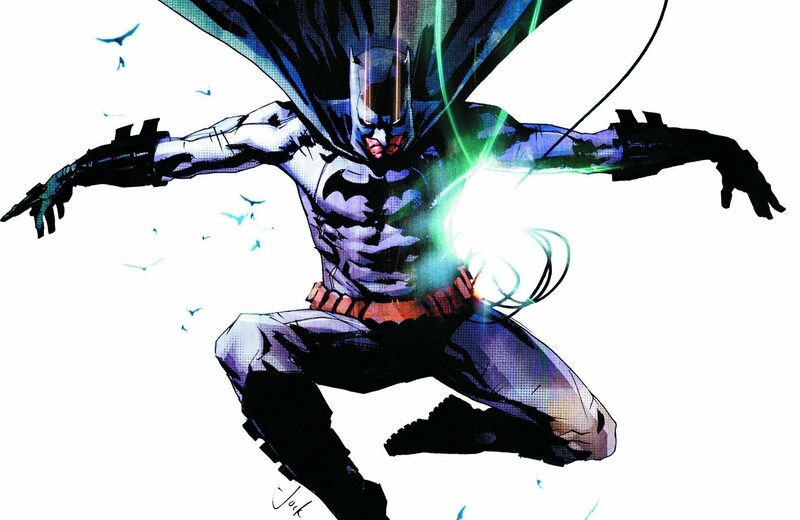 From this moment on — none of you are safe.” – Batman. Best Scene/Moment: Jim versus Flass – Issue 404. Best Issue: Issue #406. This issue showcases Miller’s general knack for scripting out taut action scenes. With the building he is hiding in being blown to pieces, and his utility belt destroyed, Batman seems trapped like a rat in a maze as the SWAT team being to buckle down on him. It’s like watching a moving tapestry, a beautiful piece of art in motion, as you see how methodical Batman, a man who is highly skilled and powerless, is in how he takes out the members of the SWAT team. It’s the most action packed sequence in the entire storyline and boy, is it marvelous. Why You Should Read It: Miller may have cut his teeth as a writer on Daredevil, but he honed his craft with his work on Batman. It is a grounded and realistic attempt at retelling the origin of one of the greatest comic book heroes ever created, working on so many levels. You’ll come for the Bruce Wayne/Batman origin but you’ll stay because of the incredible Jim Gordon story. This is hands down the best Jim Gordon story ever told and just weaves the character even more tightly into the career of the Caped Crusader. If you’re a Batman fan, or a fan of dark, action-packed comics for that matter, than Batman: Year One is a can’t miss title for you and belongs on every comic book fan’s shelf. Back in the late 1970’s, Frank Miller was just getting his start with Marvel Comics. He was penciling issues on Daredevil, drawing out Roger McKenzie’s scripts. 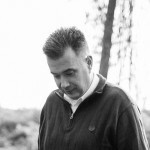 Miller would threaten to walk off the book over his dislike for Roger McKenzie’s scripts, creating an unusual power vacuum within the publisher. 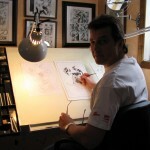 With Daredevil on a steady decline in sales, Marvel brought on a new editor, Denny O’Neil, who immediately fired Roger McKenzie and gave Miller the chance to write and draw the book. Miller would have a healthy run with the character, redefining Daredevil forever. 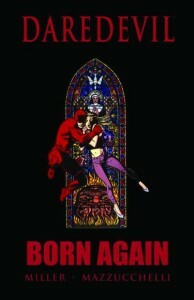 Awhile after his initial Daredevil run was completed he circled back with David Mazzucchelli in tow to tell what is easily the best Daredevil story ever told, Daredevil: Born Again. Karen Page, the long time lover and ex-girlfriend of Matthew Murdock, a.k.a. Daredevil, is struggling for survival in an exotic country. Her drug addiction has taken on a life of its own as she’s begun to sell her body just to get a fix. She commits the ultimate betrayal to her former lover when she sells out his secret identity in favour of her drug addiction. The truth behind Daredevil’s identity spreads like wild fire until it reaches his arch rival, The Kingpin. The Kingpin seeks out a slow burning and methodical revenge against Matt Murdock upon discovering his identity, looking to cripple him in every facet of his life. With his sanity compromised and everything around him falling apart, Matt Murdock must literally and figuratively fight for the life he had. Catholicism plays a part in this story but Miller integrates it beautifully. Daredevil: Born Again may be one of the finest examples of your average character disassembling arcs but done to near perfection. 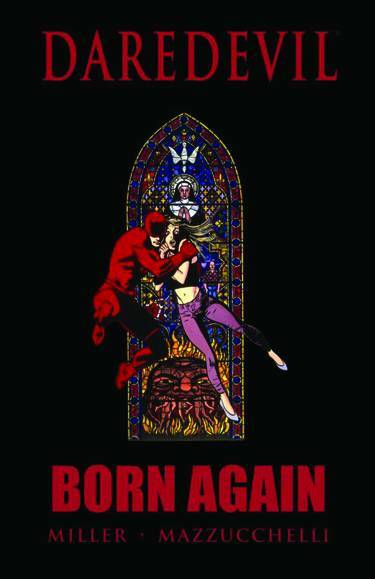 It’s wildly regarded that Born Again is not only THE BEST Daredevil story ever told but that it is one of the greatest comic stories ever told. In my personal opinion, this series is to Frank Miller as Watchmen is to Alan Moore. This, not “The Dark Knight Returns”, is the best work of Frank Miller’s career. Yes, The Dark Knight Returns defined Miller’s career, but his work with Daredevil is the soul of his career, being the character that he changed forever and made him into one of the greatest comic writers and artists of all time. As it is noted by many comic professionals from that era, Daredevil is the book where Miller got his big break, coming on to write and do the artwork fully starting way back with issue #168, taking the book to all new heights. I could genuinely sit here and talk all day about how amazing (and nearly perfect) Miller’s entire Daredevil run is but lets just stick with Born Again and how it is Daredevil, but more specifically Matt Murdock, done to perfection. Like I mentioned above, this is a character crippling arc, taking away nearly everything from Matt Murdock so that he can become “born again”. Marvel could have appropriately retitled this series of issue with the title “Matt Murdock” instead of “Daredevil” as this story arc is all about the man behind the mask, instead of the mask in front of the man. Simply put, this is a Matt Murdock story. 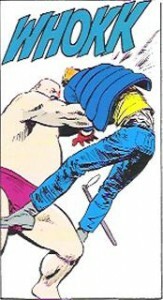 Everything he loses is personal to him, never being able to get a leg up against a foe like The Kingpin. Matt is disbarred, his bank accounts frozen, his home is taken from him, his girlfriend leaves him, everything you can think of for Matt to lose is exactly what is taken from him. Miller beautifully displays the fragile psyche of Matt, as his fractured mind results in an increasing sense of paranoia that reminds him of how helpless he felt upon initially losing his sight as a child. He is helpless, hopeless, and has nowhere to turn for help. The paranoia only begins to manifest when Murdock realizes The Kingpin is behind all this and begins to doubt his best friend, Foggy Nelson. His paranoia hits a fevered pitch when he is pushed to assault an innocent man all out of fear for his own safety. It’s almost as though Frank Miller takes the idea of Daredevil being “The Man Without Fear” and inverts it so that Matt Murdock is “The Man With Fear”. It’s a suitable juxtaposition, especially when you consider how much time you spend with Murdock out of the costume as opposed to him in it. So is it weird that The Kingpin and I have matching underwear? Ultimately, what it feels as though Miller sets out to do is hammer home the idea of the the man defines the mask, not the other way around. Miller uses The Kingpin to cripple Matt and then just piles on until you wonder if Matt will ever be able to redeem himself. Then Miller does a beautiful thing, as he taps into Matt’s Catholic nature and uses that as a catalyst for saving his character. Delving into that rich background, Miller develops a simple idea for how Matt’s life is saved and builds him back up from the brink of destruction. It’s a part of his background that plays a pivotal role in saving Murdock’s soul. The title suggests the implication of being “born again” but it’s how Miller uses Catholicism to bring Matt back from the cusp that will blow reader’s away. The religious aspect, something that can always be daunting to readers, isn’t abused and is used in a tasteful manner that only enhances the reading experience. As much as I stressed that this is a Matt Murdock story, not a Daredevil story, there are still other plot lines that are of dire importance to this story. While Matt’s fall and rise it the main story point, the other stories like Karen Page’s betrayal and attempt at redemption, Ben Urich’s bravery, and Kingpin’s rise are all integral parts of the story as well. Miller takes the time to make sure you understand where every character is coming from and where they are going. Karen is a junkie who starts out only wanting a fix but then realizes that the only thing she truly desires is Matt, making the sting of her betrayal all the more heartbreaking. You fear for Karen as you watch her scratch and claw her way towards her former lover, paying whatever cost it takes to survive and make it back to him to seek forgiveness for what she has done. 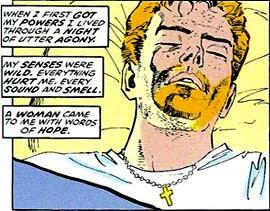 Ben Urich’s story is another one from this series that stings but for a different reason. It follows the attempts to break one of the noblest men in the Marvel Universe as The Kingpin tries to keep a stranglehold over Matt’s life. Ben’s resolve is on full display as you see him get broken only to fight back after a horrifying series of events. Every time Urich is on the page you know something incredible is coming your way, whether it be a beautiful, inspiring moment or a vile, terrifying one. Although The Kingpin is the primary antagonist of this story, his role isn’t as vast as it was in some of Miller’s previous Daredevil work. It’s The Kingpin’s presence that is far more daunting than his actual appearance, looming largely over Murdock for the entire story. 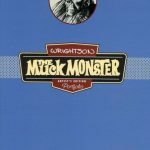 Early in the story line you get the epic showdown between Murdock and Wilson Fisk that most writers would save for the finale but Miller uses it to just further assert Kingpin’s dominance and victory over Murdock. From there it is all about the moves Fisk has made instead of the moves he is going to make. A lot of his actions have already been resolved instead of being prepared to take place, aside from his last gambit to strike out against Daredevil during the climax of the book. These are all attributes to what makes the dissolution of Matt’s character all the more stunning as Fisk makes Matt react instead of act, forcing him to be the weaker character. As I’ve said before, a strong character takes action instead of reacting and Miller finds a brilliant balance in the story by getting Matt to react until he can do such no longer, forcing him to have to act over and over until he obtains victory. Inversely, this is also why Kingpin is such a strong character under Miller’s guidance, taking action over and over before being forced to react. It’s a beautiful scale like comparison where one side holds all the power and tilts the scale until the other side fights back and turns the scale in their favour. So as I said above, this is Frank Miller’s equivalent of “Watchmen” and in my opinion, Miller is the greatest writer/artist combo to have ever graced comics and maybe even the best overall writer ever. Why? It has to be the man’s vocabulary and how well he uses this weapon in his writing arsenal. Miller injects this raw nature into his writing that I’ve never seen done as well as he does it. The level of detail and description he puts into the captions that show up in all his work is second to none. The way he sets a scene, the way a moment is described, is novelistic in its approach and puts countless professional writers to shame. He can make the sound of a muffled engine bursting to like sound like a symphony, the rattle of a shower head turning on become a peril-less adventure. As far as I’m concerned, any time Miller chooses a word to appear on page, something beautiful happens. His words are deliberate in every move they make and it is a true treat to re-read anything Miller has ever done with The Man Without Fear. There’s only one man in comics who writes captions like the one above. That man is Frank Miller…and to be far this isn’t even a great example of how he does it. Best Line Of Dialogue/Caption: “And – I have shown him that a man without hope is a man without fear.” – The Kingpin. Best Scene/Moment: Ben Urich hears something on the phone that sends chills up his spine – Issue #230 – “Born Again”. Best Issue: Issue #231 – “Saved”. This issue marks the moment that Matt truly gets back on to his feet and back into the world. The Kingpin has thrown his best at him and he’s still survived in spite of it all. Here you see Matt starting to fight back for all the people in his life who need help more than ever. There’s plenty of powerful scenes featuring Ben Urich, Karen Page, Foggy Nelson, and especially Matt Murdock. In all honesty, you could pick any issue in this collection as the “best issue” and be perfectly correct in making an argument for it. Why You Should Read It: This, not The Dark Knight Returns, is THE BEST work of Miller’s career. 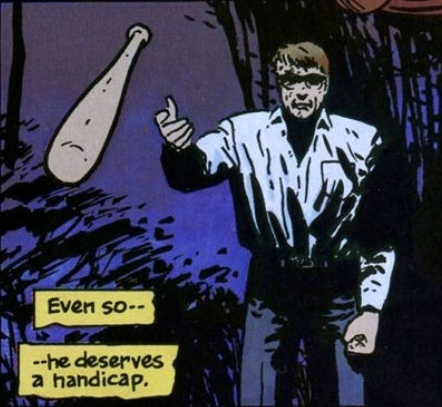 In my honest opinion, Miller’s work with Daredevil is the single greatest character run that any writer in comics has ever had. He not only elevated Daredevil and saved the series from cancellation way back in the day, he defined Matt Murdock. This is the best Matt Murdock story ever. This is the best Daredevil story ever. As far as I’m concerned, this story is right behind Watchmen as one of the greatest superhero stories ever. I don’t need to ramble on, go read Miller’s entire Daredevil run and save this for last. I promise you won’t be disappointed. 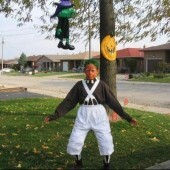 Dylan is the Assistant Manager for Big B Comics Hamilton. In his spare time he loves to talk, read, and write about all things comic book related. Frank Millers two stints on Daredevil are probably my all time favourite comic book runs. It felt like Marvel comics had really “grown up”. It is also the reason why DC stole Miller from Marvel so that he could update Batman in a similar vein. I should also note that I thought he was an excellent artist as well as a brilliant writer – though he did not do the art for the Born Again story arc. Another great post Dylan. I have really enjoyed this ambitious “writer” focused series. You have introduced me to some new writers and brought along a few old favourites for the ride. Keep ’em coming. Alan I couldn’t agree with you more about those two DD runs. You knew they were something special when they were coming out, and they seem even better today. One of my all time favourite comic book moments is from Born Again… when the Avengers show up. Not just my opinion… often talked about over and over again when the subject of “best moments” comes up. Hope they make it happen in the TV series. Speaking of Miller… is anyone looking forward to DKR III: The Master Race? I lost interest in Miller after Sin City but the nail in the coffin for me was Holy Terror. Since when was DKR been a trilogy anyways? In all honesty, I’m mixed about this. I hope Miller will come back swinging. If he can reclaim his title, like Muhammad Ali and Steve Jobs, it will cement his name as one of the greatest. However, a dismal failure will be seen as another shovel of dirt from the creative hole he’s dug himself into. The other part I don’t like is that he’s got a partner this time in Brian Azzarello. Not sure if this is DC hedging their bets but while leveraging the Miller name… but it wont be a pure Miller story. Which means, good or bad, it wont be a real measure of Miller current ability. I think Miller really needs Klaus Janson (and maybe Varely) in the same way that Byrne needs Austin. Jansons inking style lends itself so well to Millers pencils that he truly contributes to the art. Janson legitimizes the figures and is able to keep Millers art in check. Personally, I feel the art on Sin City really suffers from the lack of a good inker. Ultimately, Miller is an ideas man, but he needs the craftsmanship of Janson to have his ideas manifested and communicated. One of the primary difference between DKR and DKR II was JANSON!